From his arrival in Britain in the 1950s and involvement in the New Left, to founding the field of cultural studies and examining race and identity in the 1990s and early 2000s, Stuart Hall has been central to shaping many of the cultural and political debates of our time. 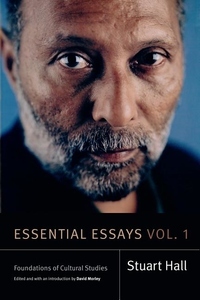 Essential Essays--a landmark two-volume set--brings together Stuart Hall's most influential and foundational works. Spanning the whole of his career, these volumes reflect the breadth and depth of his intellectual and political projects while demonstrating their continued vitality and importance. Volume 1: Foundations of Cultural Studies focuses on the first half of Hall's career, when he wrestled with questions of culture, class, representation, and politics. This volume's stand-out essays include his field-defining "Cultural Studies and Its Theoretical Legacies"; the prescient "The Great Moving Right Show," which first identified the emergent mode of authoritarian populism in British politics; and "Encoding and Decoding in the Television Discourse," one of his most influential pieces of media criticism. As a whole, Volume 1 provides a panoramic view of Hall's fundamental contributions to cultural studies.